This section includes examples of planes of weakness that have unusual characteristics, complex form, or that cannot readily be classified into one of the other sections. This feature appears to be the top or near-top of an anticline in alluvial sedimentary rock. Evidence of bedding planes can be seen as indistinct lines paralleling the ground. These lines are faintly visible on the vertical rock surfaces (40 cm high) that obliquely face the camera. 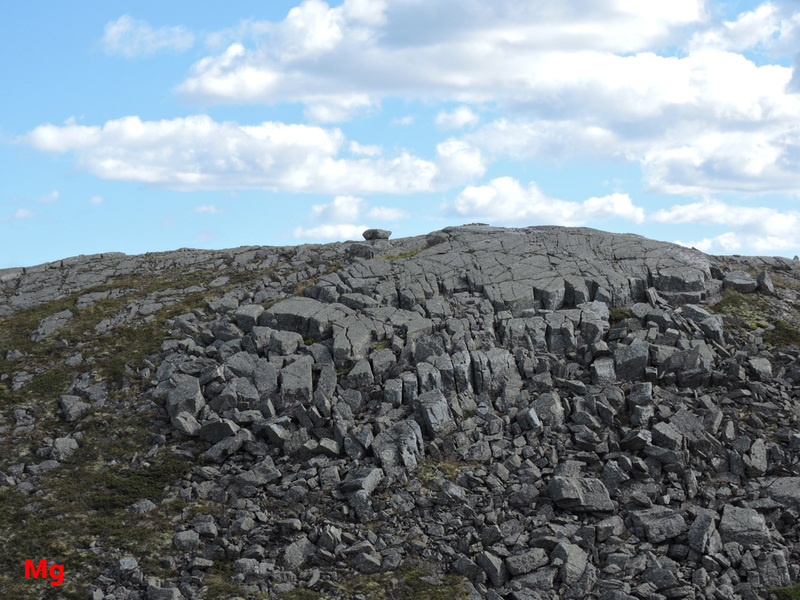 The tops of the two strips of glacially-eroded bedrock appear to be bedding plane surfaces. The conspicuous joint set cutting across the beds has a strike 18 deg. E of N. This suggests that the joints are compressional tectonic joints, aligned in accordance with the general trend for regional metamorphism in this part of Heart of Avalonia. Normally, the joint set would be classified as a longitudinal joint set, but in this case the joints are aligned at 90 degrees to the axis of the fold, making them cross joints. The anticline itself is misaligned with the expected direction of compressional tectonic stress by 90 degrees. The photos above show two different views of the same area of alluvial sedimentary bedrock. The rock has been glacially eroded and frost weathered. The distinct closely-spaced jointing visible somewhat edge-on in both pictures is compressional tectonic jointing striking approximately 20 deg. 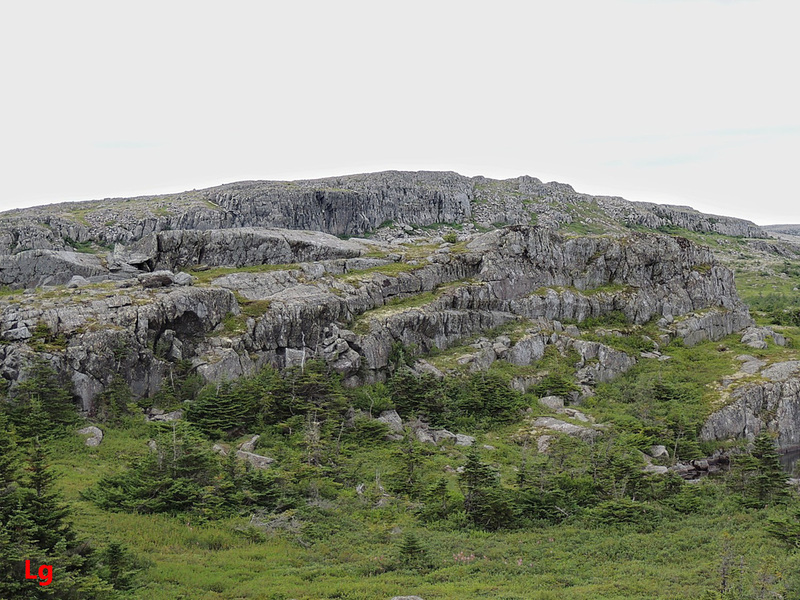 E of N. The elongated near-vertical rock faces visible in the left photo and seen approximately facing the camera in the right photo are failure surfaces formed by glacial ice acting on a set of tectonic cross joints. Other flat surfaces, aligned at oblique angles, can be seen in the photos. 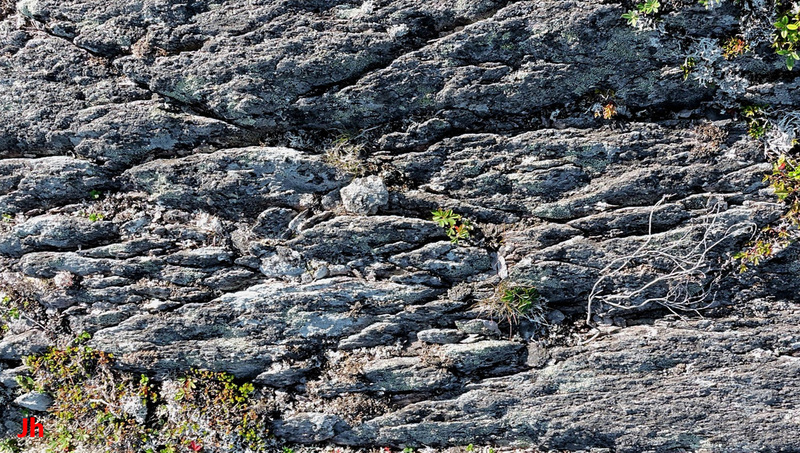 There are several surfaces and joint sets present in this rock that do not appear to correlate with directed tectonic stress from the Acadian orogeny. A previous episode or episodes of tectonic deformation of these rocks may account for the unexpected joints and failure surfaces. 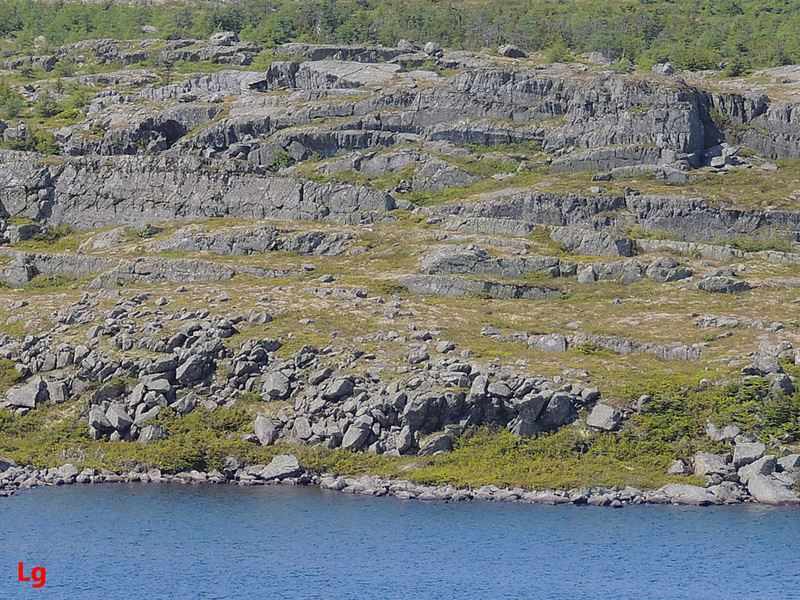 The alluvial sedimentary rock surface shown above appears to have been cleaved along a plane of weakness by glacial erosion. A second glacially-eroded plane is visible sloping downward from the top of the ridge, toward the right. There are two joint sets intersecting the surface shown in the foreground. 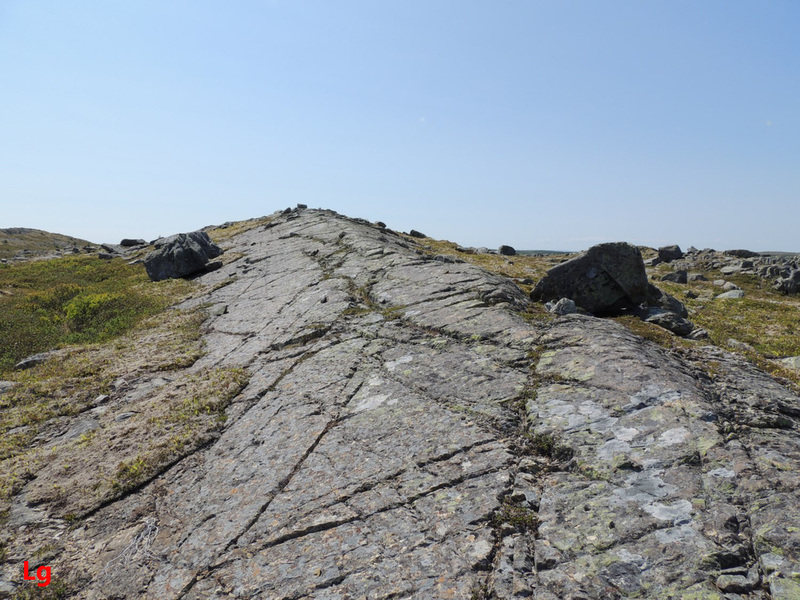 The relationship of the joint pattern and the ice-eroded surfaces to the stress direction associated with the Acadian orogeny is ambiguous for this rock outcrop. 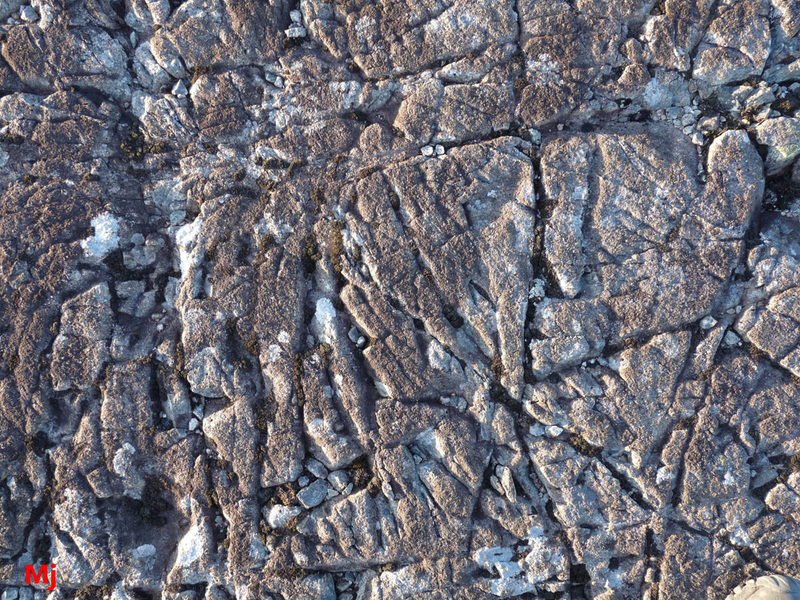 The horizontal ignimbrite bedrock surface shown above (width of view 50 cm) shows crenulation cleavage, or two intersecting sets of cleavage planes or joints. One of the cleavage directions in this rock corresponds to compressional tectonic cleavage, while the origin of the other cleavage direction might be shear strain induced by rheomorphic flow, remnant from when the ignimbrite was deposited. Alternatively, a second episode of compressional tectonic stress might have partially overprinted the cleavage from a previous episode. 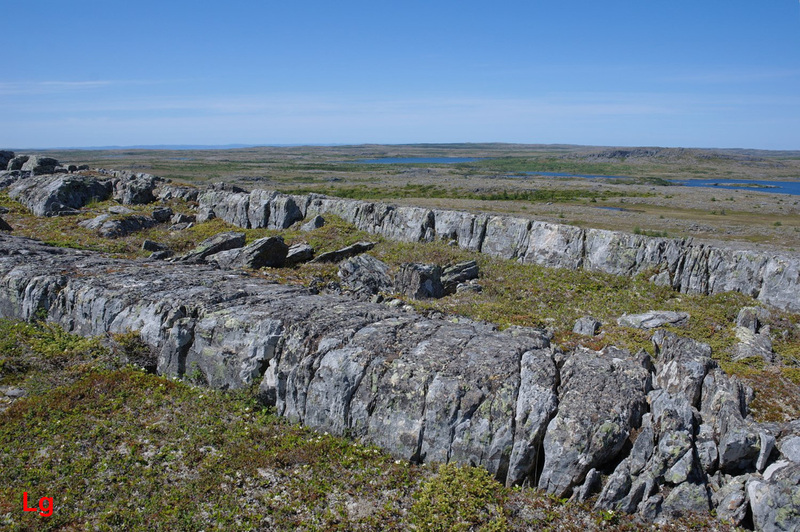 This alluvial sedimentary rock has broken apart into large blocks (individual dimensions of the order of 1 m) following glacial ice loading and subsequent frost weathering. The underlying pattern of joints and failure surfaces appears chaotic and unrelated to tectonic stress. However, the rocks shown above lie in a strongly folded area where tectonically aligned jointing would normally be expected. Both of the pictures above show horizontal bedrock surfaces about 1 m wide. The rock in the photo on the left is basalt, while the rock shown on the right is fine-grained granite. The erosion-etched patterns might reflect underlying weaknesses or jointing in the rock, or the patterns might be only superficial, caused by water penetrating the rock and then by frost weathering. 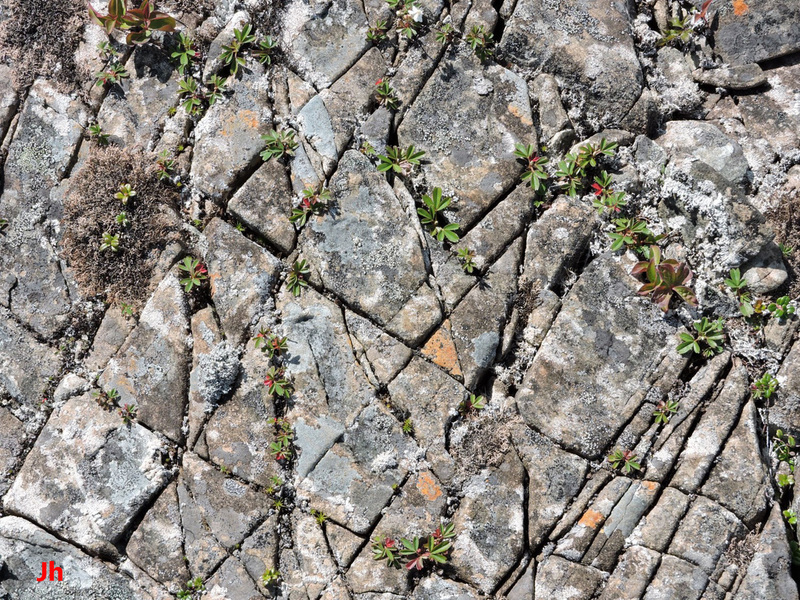 If the patterns reflect joints or weaknesses in the underlying rock, then the origin of the weaknesses is likely in thermal contraction of the rock after solidification.